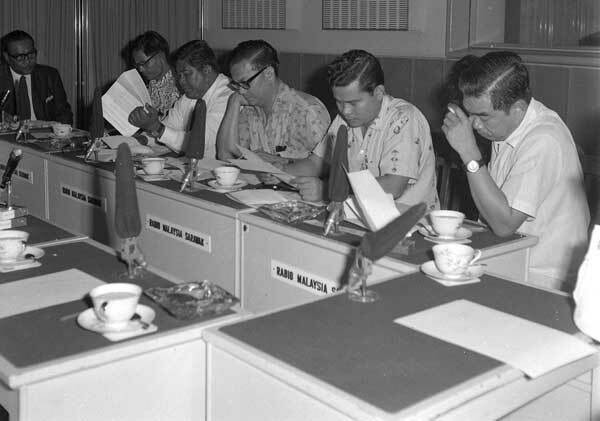 MEDIA BRIEFING: Members of the media getting a briefing for 1969 state and general (parliamentary) elections. Photos courtesy of Information Department. SARAWAK — with its vast land area of 124,450 sq km and often demanding terrain — needs special attention when it comes to elections as a large number of the constituencies are situated in the interior. To overcome the logistics and communications hurdles posed by the state’s challenging geographical features, the Election Commission (EC) has no choice but to allocate more funds for Sarawak. In this regard, the Kenyalang state has been allocated RM78 million for the 13th General Election. With the vastness of its land area, Sarawak, not surprisingly, tops the whole country vis-à-vis the number polling stations — 7,227 across the state. “The expenses have to be high if we want everyone — who is eligible to vote and who wants to vote — to exercise his or her democratic rights. “We also have to include expenses for sending our officers to the very remote areas to monitor the polling,” state EC director Datuk Takun Sunggah told thesundaypost. Citing the 1996 state election, he said there was only one voter in Long Wat, Belaga, but to allow the voter to exercise his democratic rights, EC officers had to fly in by helicopter to provide him the full voting facility. Without helicopters, Long Wat can only be reached after at least six hours driving from Bintulu — the first three hours along the road to the Sungei Asap Resettlement area and the next three through hilly terrain and winding logging tracks. The bulk of the election allocation for Sarawak goes to transportation. For this general election where the stakes are high and a fierce battle expected between both sides of political divide, the state EC has been working hard on every detail to ensure smooth polling. For land transport, 4,819 land crusiers and cars will be used. As many interior areas are accessible only by rivers, 780 longboats and 56 motorboats will be standing by to either ferry voters or returning officers to and from the polling stations. To reach the inland areas accessible only through logging tracks, 27 helicopters are ready to be deployed. Two fixed-wing aircraft may also be used to transport the returning officers and the ballot boxes. Table : The years of Malaysia Parliamentary Elections and Sarawak State Elections since independence. Sarawak stands out among the other states not only in terms of land size and the attendant complexities in electoral procedures but also other pecularities, including not holding concurrent state and general (parliamentary) elections — unlike the rest of the nation. It wasn’t like this in the beginining. In 1969, for instance, Sarawak held its first state as and parliamentary elections simultaneously like every other state. However, due to the state’s sheer size and accessibility problems, 28 days (from May 10 to June 7) were allocated to complete the democratic process whereas only one day for polling was dedicated to the other states. This first state and parliamentary elections in Sarawak were also interrupted by the May 13 incident and the subsequent Declaration of Emergency. Polling only resumed a year later on July 29, 1970. In Sarawak’s second election (1974), state and parliamentary polls were also held together but unsolved transportation and logistics problems caused polling to stretch over three weeks — from August 24 to September 14. In April 8, 1978, the country held its fifth state and parliamentary elections. Sarawak was the exception as it only held its parliamentary election and this time around, polling was shortened — from 22 to eight days (September 15 to 22). Sarawak only held its state election the following year (1979). According to Sarawak United People’s Party (SUPP) former president Tan Sri Wong Soon Kai, this was because the state BN government had decided to disassociate itself from the politics of peninsular Malaysia. For this reason, Sarawak held its state and parliamentary elections separately — and has been adhering to the practice since 1979 whereas all the other states still hold the two elections concurrently (see Table ). With the practice becoming seemingly a tradition, Sarawak has since been experiencing an election – state or parliamentary (not including by-election) — at an interval of every two to three years of each other. 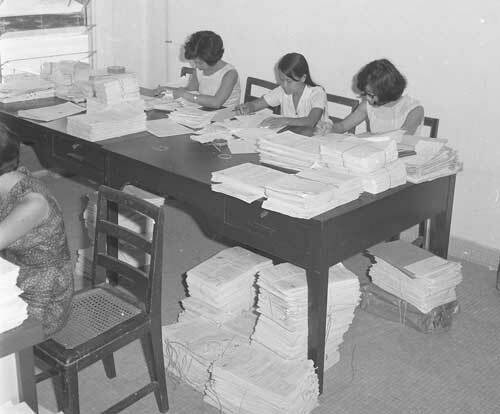 HARD AT WORK: The General Election Regulation Commission Office at Ban Hock Road, Kuching (1969). Sarawak with its vast size has the highest number of parliamentary seats – 31 out of 222. The size of the state’s parliamentary constituencies is also much bigger than those of the other states. For instance, in terms of land area, the constituency of P216 Hulu Rajang is equivalent to the whole Pahang (which has 14 parliamentary seats). Also, the constituency of P220 Baram alone is as big as Perak (24 parliamentary seats). Though not known for its land area, Johor has the second highest number of parliamentary seats (26), followed by Sabah (25) though it’s the second largest state. Coincidentally, in the 2008 general elections, the three states (Sarawak, Sabah and Johor), numerically superior in terms of seats, were the biggest contributors to Barisan Nasional’s winning tally of 140 seats. The three BN strongholds lost only one parliamentary seat each. The Sarawak BN retained 30 seats, losing only Bandar Kuching to DAP. Johor won 25 out of 26 seats while Sabah won 24 out of 25 seats. In this regard, perhaps apart from Sarawak and Sabah, Johor may also be termed as the fixed deposit of BN if the ruling coalition can continue to maintain its performance in that state. Based on the 2008 score, the seats won by BN in the three states added up 79 — more than half the total (140) won by BN. That’s perhaps why the opposition is now aiming to capture as many seats as it can in the three states. Only when the opposition is able to achieve a breakthrough in these BN strongholds will it have a chance to capture Putrajaya. 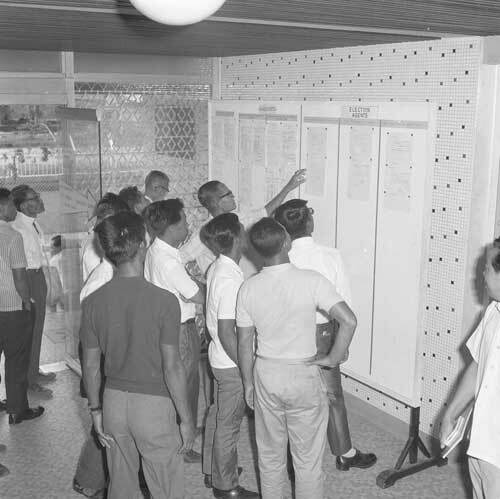 SCRUTINY: Display of candidates for public objection in Sarawak’s first simultaneous state and parliamentary elections (1969). Another interesting point is that in the last parliamentary election, there were eight candidates winning uncontested — all from Sarawak, Sabah and Johor. Of the three states, Sarawak has the most unopposed victorious candidates. They include Datuk Norah Abdul Rahman (Tanjung Manis), Datuk Wahab Dolah (Igan), Ago Dagang (Kanowit ), Joseph Entulu Belaun (Selangau) and Alexander Nanta Linggi (Kapit). Sabah, with the second highest number of parliamentary seats, won two uncontested through Tan Sri Datuk Seri Panglima Joseph Kurup (Pensiangan) and Datuk Seri Abdul Ghapur Salleh (Kalabakan). Johor which has third highest parliamentary seats won only one uncontested in Pengerang through Datuk Sri Azalina Othman.